Mentioned is the way you can write Hotel Laundry and Dry-Cleaning Worker CV Template. 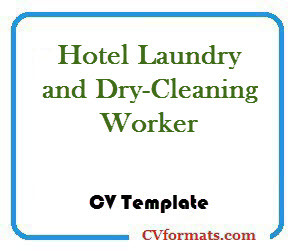 People looking for jobs can easily download these Hotel Laundry and Dry-Cleaning Worker CV formats in editable pdf and MS-Word (.doc) formats or you can just copy and paste from or website CVFormats.com and app. Cover letter of Hotel Laundry and Dry-Cleaning Worker CV Template is also available. Just change the name , address , qualification and experience and your Hotel Laundry and Dry-Cleaning Worker CV Template is ready. Inspect soiled articles to determine correct washing method and identify items requiring special washing treatment. Regulate laundry equipment to attain the right spin speeds, volume of, water, bleach, detergent, and other additives for the right clothing fabric. Retrieve and sort cleaned and dried articles, fold, wrap, hang and prepare for delivery to client. Mix detergents, bleaches, starches, dyes, and other chemicals to clean, whiten or stiffen fabric.